Snow total expectations have increased in some areas and new warnings have been added. Here’s the latest. TODAY: Temperatures could reach the low 40s in some areas, with spotty showers here and there. Southerly winds around 10-15 mph across the area. Precipitation will begin creep northward toward the evening hours. Little impacts are expected during the day today. THIS EVENING: Areas to the west and the south will see precipitation first. A mix between freezing rain and sleet is likely at first, which can have immediate impacts on travel if intense enough. As colder air arrives, most precipitation bands will be all snow by Saturday morning. 1-2 inches from late Friday night into early Saturday morning is possible. SATURDAY INTO SUNDAY: By around 6 a.m. Saturday, heavier snow bands will be pushing through our area, particularly the areas included in the Winter Storm Warnings. Locations under winter weather advisories could still see periods of heavy snow, but less frequently. 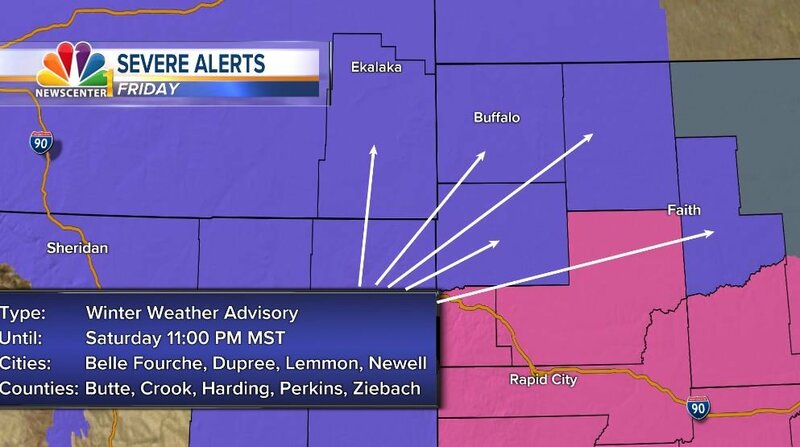 Locations like Rapid City could see an additional 4-6 inches of snow during this time period, with temperatures hovering just below freezing. 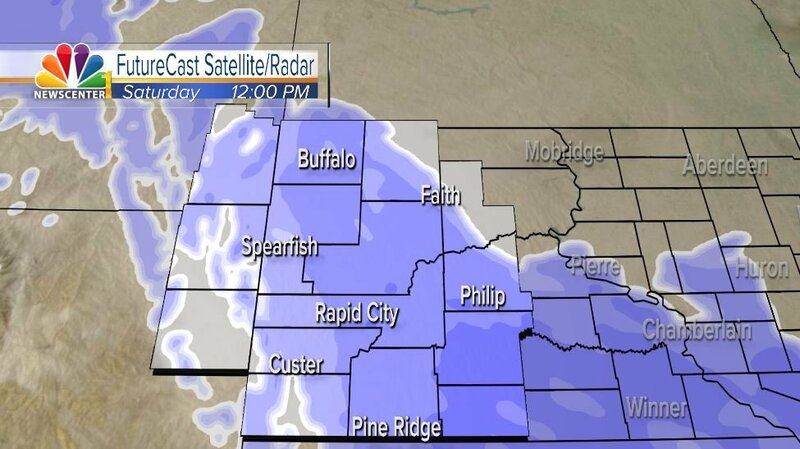 Blowing snow is a possibility into the afternoon and evening hours as heavier bands continue to pummel the area. Latest model guidance suggests a dry pocket could develop during Saturday’s snow bands. Wherever this dry air sets up, it could lead to less snow than forecasted for the affected area. 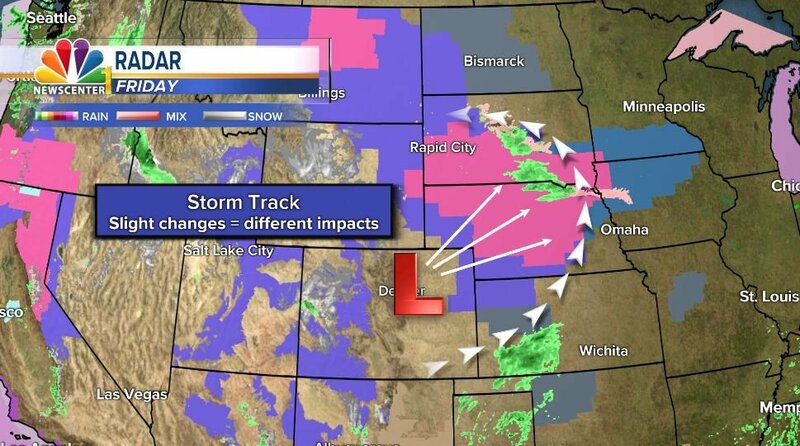 This exact track and location of the storm system will determine much of this. 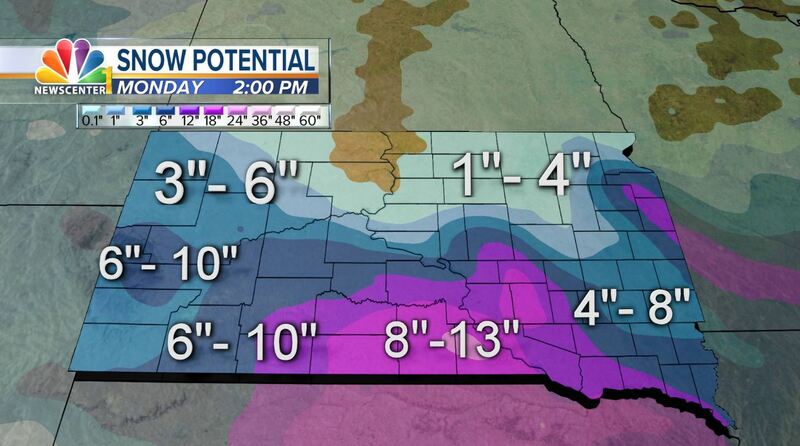 At least several inches of snow can be expected for most of our viewing area. 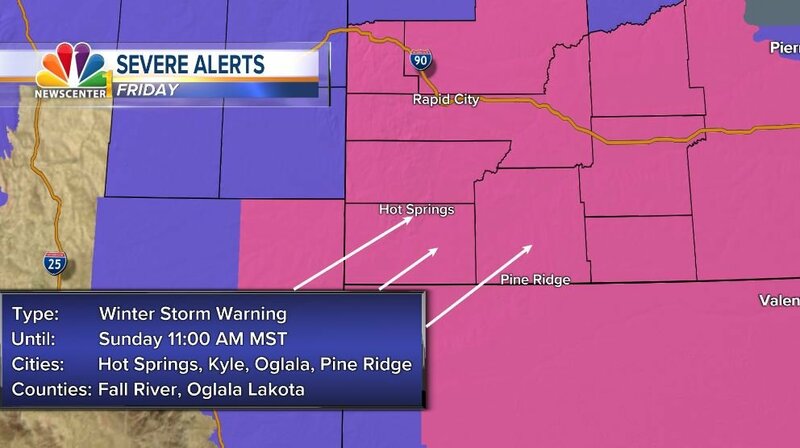 Winter Storm Warnings and Winter Weather Advisories have been issued for our area. Let’s break down each warning and the impacts. IMPACTS: A mix of freezing rain and sleet will take place Friday evening before transitioning to snow. 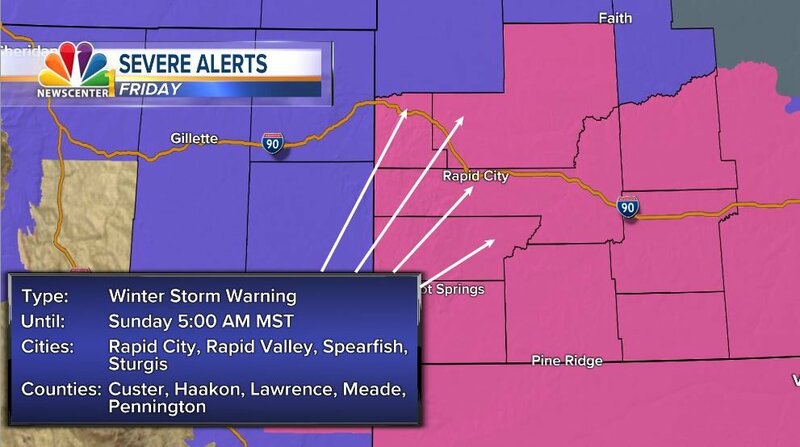 6-10 inches of snow expected in Rapid City, Sturgis and the foothills, and 5-8 inches of snow is expected in the plains by Sunday morning. 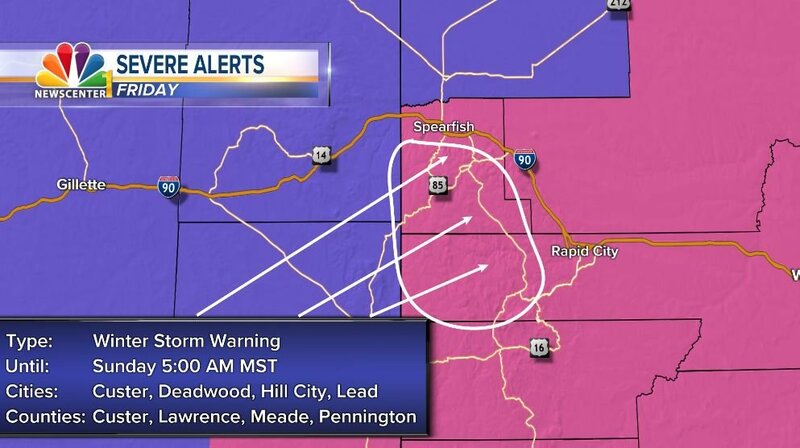 Patchy blowing snow is possible. IMPACTS: A mix of freezing rain and sleet will take place Friday evening before transitioning to snow. 6-10 inches of snow is expected by Sunday morning. Patchy blowing snow is possible. IMPACTS: A mix of freezing rain and sleet will take place Friday evening before transitioning to snow. 6-9 inches of snow is expected by Sunday morning. Patchy blowing snow is possible. IMPACTS: 2-5 inches of snow is expected by Sunday morning. Expect snow-covered roads. 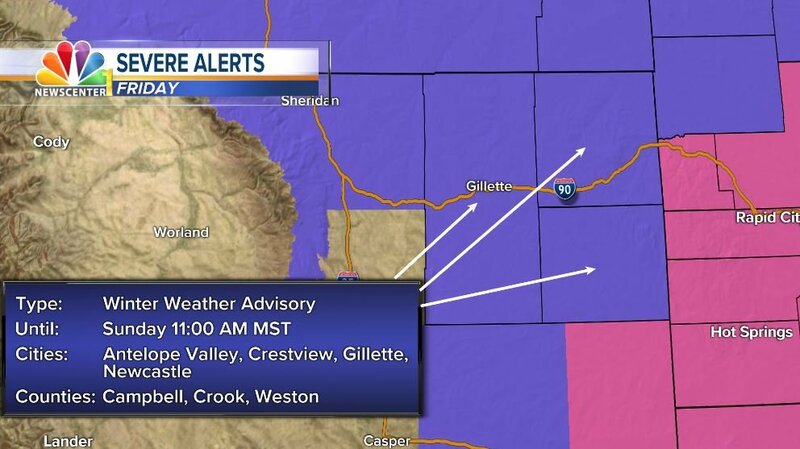 IMPACTS: 4-7 inches of snow is expected in other areas of NE Wyoming by Sunday morning.